Kugel should be love at first bite. If, heaven forbid, the only kugel you have ever eaten was tasteless and went down like a lead balloon, you have never eaten good kugel. 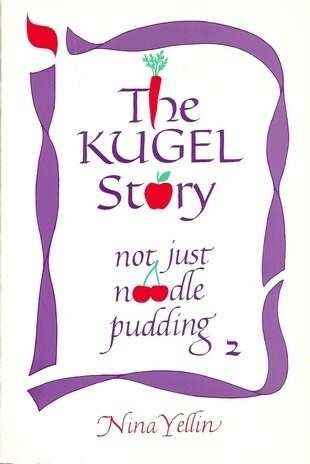 THE KUGEL STORY - NOT JUST NOODLE PUDDlNG 2 has more than 175 of the world's greatest kugel recipes - with the author's favorites starred. Menus for kugel meals are sensational and the traditional kugel-related recipes are great. WHAT'S A KUGEL? Basically it is a souffle-like to bread-like, pudding-type casserole that is one of Jewish cuisine's most versatile foods. It can be sweet or savory. Kugel is served as a side dish, main course, snack or dessert, hot or cold, and is especially popular at holiday time and at ceremonial celebrations. The recipes in this book range from the simplest -- with just four ingredients -- to more gourmet varieties. Nina Yellin has catered many parties with kugel as a featured item and qualifies as a kugel authority by virtue of her extensive collection of kugel recipes, experimentation, testing and research.